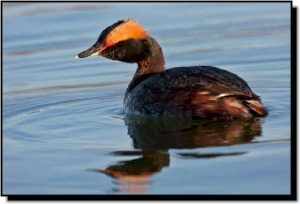 Comments: During the breeding season, this striking grebe has a rufous neck and flanks, dark back and face and solid yellow “horns.” Its eyes are red, even in the nonbreeding season. Wintering birds have white cheeks, throat, neck and lower flanks. The shorter, straighter, white-tipped bill and flatter crown of Horned Grebes distinguish them from Eared Grebes. The smaller size and shorter, dark bill distinguish them from Red-necked Grebes. Horned Grebes breed in the northern Great Plains, usually solitarily or in small colonies. They winter in sheltered marine environments and occasionally on the open sea. In the southern Great Plains they are found on inland waters. Declines in breeding numbers are suspected. Several conservation activities, such as preventing the encroachment of woody vegetation around wetlands and maintaining stable water levels during nesting, have been incorporated into habitat management plans to increase breeding success.